For 200 years the Canons of Durford Abbey served the church as clergy. While hunting locally, both Edward I (in 1274 and 1296) and Edward II (in 1324) stayed overnight at the Abbey, which was dissolved in 1536 and finally demolished in 1784. 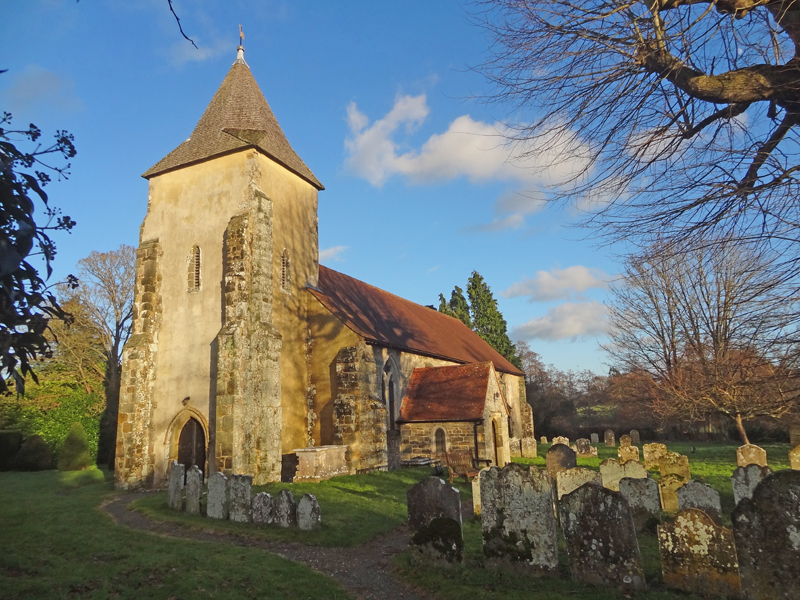 In the 1650s, during the civil war, the vicar was too conservative for the puritan authorities: the Rogate living was therefore combined with Terwick where the rector was more politically correct. After the Restoration in 1660 the parishes separated again. The plague killed one entire Rogate family in 1666; otherwise Rogate escaped further infection. As the area became less prosperous the church was neglected. The Victorians set about restoring historic churches and in 1874 St Bartholomew’s was renovated and remodelled. The musicians’ gallery was removed and the bell tower relocated. In 1952 the parishes of Rogate and Terwick were united as one benefice and in 1982 Trotton and Chithurst were added to make a united benefice of the four ancient churches. 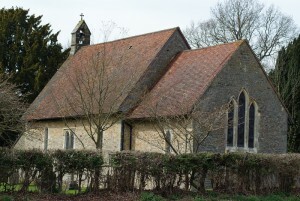 This simple church stands alone among fields and woodland, against the distant background of the South Downs. It has an atmosphere of rare tranquillity. Outside the west door of the church is a cross dating from early Norman times. Christians probably gathered here for worship before the church was built in about 1140. There has never been a village of Terwick as the soil near the church is poor; in fact the name ‘Terwick’ may mean ‘rubbish (turd) farm’. In 1646 there were only five houses in the parish but they may have been substantial households. Perhaps the church served drovers and other travellers as well as the permanent parishioners. The Rev. George Laycock (like his predecessor, Rev. W.S. Richards) was Rector of Terwick for over 40 years until his death in 1933. He lived in the beautiful nearby rectory, which was bigger than his church and the minimal parish duties left him plenty of time for other interests. Both Laycock and Richards are buried in the churchyard. They could never have anticipated how different life would be for their successors. Mr and Mrs Hodge of nearby Fyning House both died in 1939. They left Church Field to the National Trust in the hope that the lupins would continue to bloom there. From season to season they vary in quality but are at their best in early June. The lupins are commemorated in an altar frontal given to St Peter’s to celebrate the millennium. For some 150 years (1268-1419) the powerful Camoys family worshipped at Trotton. They were of course Catholics and Sir Ralph twice made the long and dangerous pilgrimage to Santiago de Compostela in north west Spain. In about 1380, the walls were frescoed, a common feature of mediaeval churches across Europe (especially Italy) at this time. The paintings were whitewashed over in the Reformation but were re-discovered in 1904, alas, rather badly damaged. However they still give a vivid impression of a decorated mediaeval church. As warrior knights, the Camoys fought at Bannockburn, Crécy and Agincourt. The family was of such high social standing that Thomas, the first Lord Camoys married a great granddaughter of Edward III. This second wife was ‘Gentle Kate’ the widow of Henry Percy, Shakespeare’s ‘Hotspur’ (Henry IV part one). The church is notable for two fine memorial brasses. The first (1310) commemorates a woman, perhaps the first to do so. The other (1419) depicts Lord Camoys and his aristocratic second wife. Lord Camoys had Trotton bridge built over the river Rother in about 1400. The mediaeval engineers built it for horses and wagons, but 600 years later it is to their credit that their bridge is able to carry a huge volume of modern traffic. A ‘small church’ is listed at Chithurst in the Domesday Book. The church as it exists today has a wonderful simplicity. 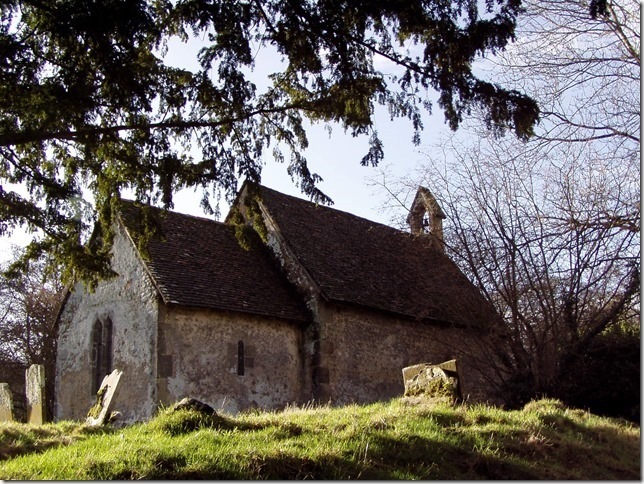 It is sited on a mound above the river, surrounded by an ancient churchyard, and has an atmosphere of quiet agelessness. The lack of electricity or modern heating adds to its charm, as services are regularly held by candlelight in an almost mediaeval chill and damp. In AD 1724 sixteen families lived in the parish. 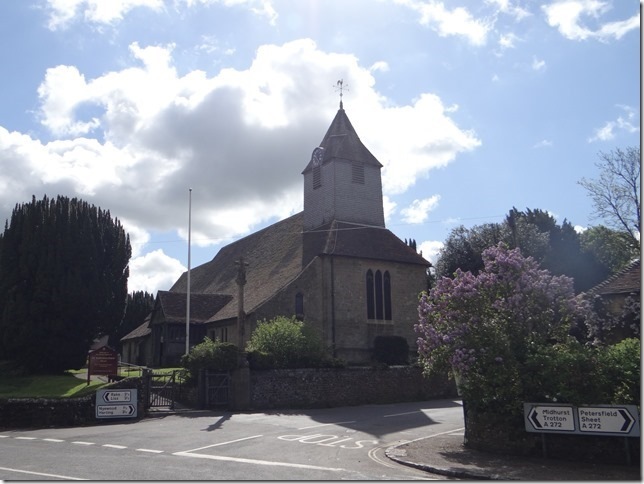 During the 1740s the Rector of nearby Iping and Chithurst was also Rector of Terwick and in addition served as curate of Rogate. The clergy at this time were often absent or very lax, but Rev. John Denham was greatly loved and respected and seems to have ministered dutifully to his combined parishes. However he met a brutal death. The mid-eighteenth century was a lawless time, with the growth of smuggling along the south coast. In 1748 a smuggling gang killed two men near Rogate. In 1757, the unfortunate Rev. Denham was murdered in a field not far from Chithurst. The murderers in both cases were swiftly caught and hanged. After that, the parishes returned to a more peaceful way of life which has continued until the present day.